Let’s look at adaptations as damselflies move through their life cycle. 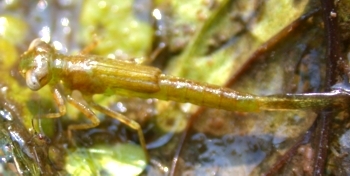 Males have claws that they use to hold the female damselfly when they are mating. 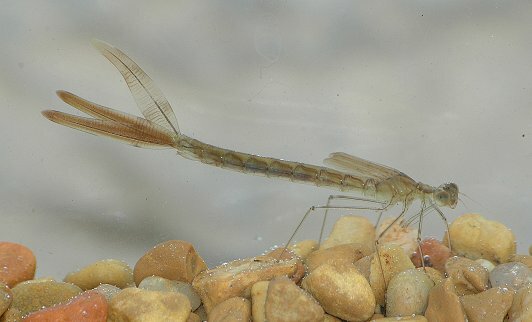 Once that’s over, females use ovipositors that help them lay eggs on overhanging plants or sheltered surfaces underwater. They also produce fewer eggs because they live close to water sources, and this results in a high success rate. While most damselflies live near constant water sources, some are not as fortunate and deposit eggs in ponds that may dry. In this case, the damselfly eggs are diapausing so they can survive the dry spells; once water refills the pond, the eggs will hatch, and the life cycle continues. After the eggs hatch into naiads, there are new adaptations. The naiads that live in fast-flowing streams have claws that help them hold on to surfaces to make sure the current does not sweep them away. Other naiads use their long legs to help them walk and prey on other organisms. Their three feathery gills have large surface areas, allowing for higher levels of gas exchange while breathing. Naiads developed two different life cycles in order to decrease predation risks. Slow life style naiads do not have high activity levels and do not use most of their habitat's space; as a result, they develop low metabolisms, feeding, growth, and development patterns. On the other hand, naiads may life a fast life style where they live in ponds that dry periodically; this means that the predators do not have enough time to complete their life cycles and that the naiads must develop quickly so they do not perish either. In these cases, the naiads move quickly with fast metabolisms and high levels of activity and habitat use; fast life style naiads complete their life cycle much more quickly than slow life style naiads. 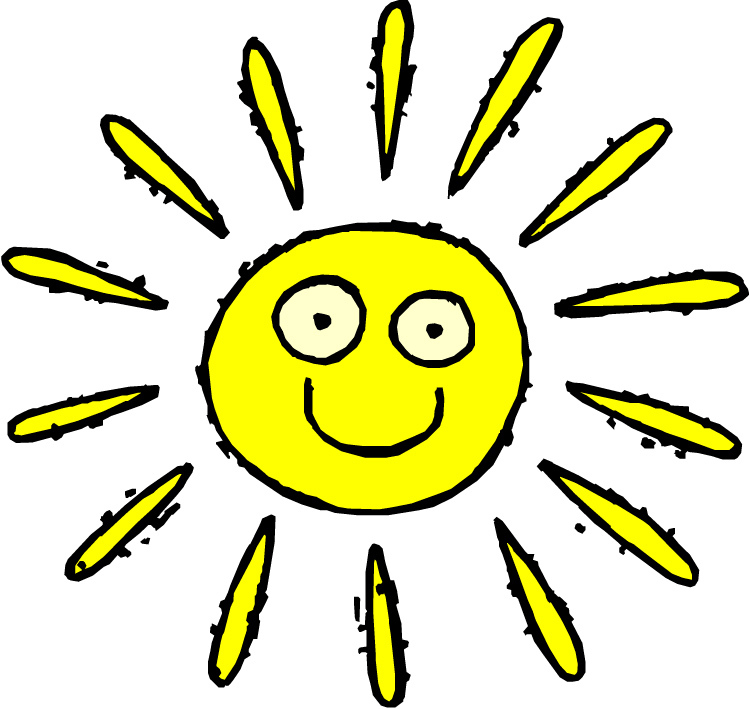 Before adults fly each day, they have to warm themselves, so they must have sunlight, not cloudy days. To make sure it is warm enough, the damselfly basks in the sun to absorb as many rays as possible. Then, the damselfly shivers its flight muscles rapidly to create its own body heat in addition to the sun’s heat. However, if the damselfly is larger, it may over heat, so to combat this, they take longer glides between beating their wings. All these are forms of thermoregulation! Damselfly adult legs are strong, but are more often used to capture and hold prey instead of walking. Compound eyes help damselflies to integrate sensory information from their environment to help them survive. Each eye is made of thousands of ommatidia; an ommatidia has a lens with receptor cells that captures a portion of an image. The damselfly's brain gathers all the individual images to create one, large picture. 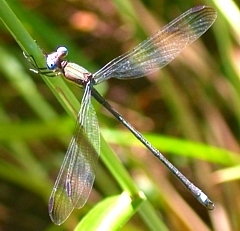 As a result of the high amounts of visual information, a damselfly's brain has a highly developed optic center to accommodate the sensory signals. Wow! Damselflies are complex organisms! Are you hungry? Click here to see if you would like to eat lunch with a damselfly.